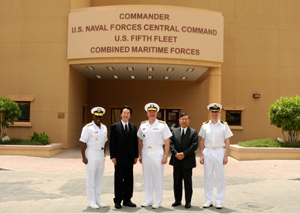 BAHRAIN – A high level delegation of Japanese officials visited the headquarters of Combined Maritime Forces (CMF), May 6. Left to right: Rear Adm. Kevin Scott, Mr. Mitsu Shimojo, Vice Adm. Mark Fox, His Excellency Mr. Shigeki Sumi, Commodore Simon Ancona. The visit of Mr. Mitsu Shimojo, Parliamentary Vice Minister, Japanese Ministry of Defence, was to highlight the work of CMF and the contribution Japan makes to the 26 nation coalition. Accompanied by His Excellency Mr Shigeki Sumi, Japan’s Ambassador to Bahrain, as well as other high level dignitaries, the delegation was welcomed by Vice Admiral Fox, Commander Combined Maritime Forces. The visit included discussions about the ongoing successes of CMF’s activities to disrupt terrorism, piracy and armed robbery at sea. Japan has been a member of CMF since 2003 and currently contributes a Senior Naval Representative to the headquarters’ staff and a range of assets including Maritime Patrol Aircraft.